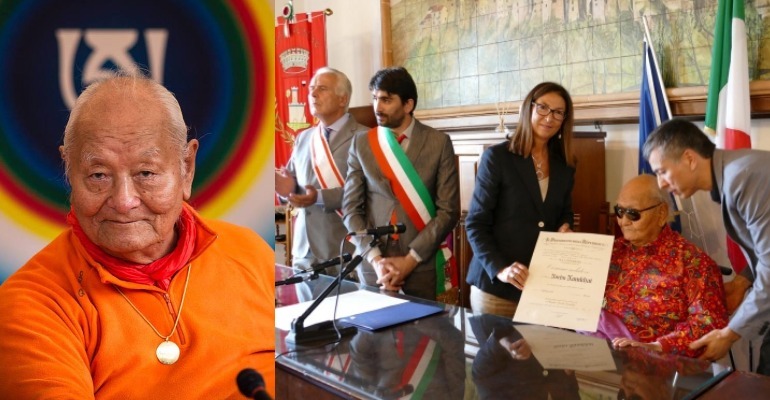 ARCIDOSSO, Italy: One of foremost Tibetan Buddhist master, Professor Namkhai Norbu Rinpoche, was honoured with Italy’s highest recognition, Commander of the Order of Merit of the Italian Republic on Monday. The Prefect of Grosseto, Cinzia Torraco, on behalf of the President of the Italian Republic, presented the award at a ceremony held in the presence of Mayor of Arcidosso Jacopo Marini and the president of the regional council of Tuscany Eugenio Giani. The ceremony was held at Council Chamber of the City of Acridosso on 10 September. In the late 1950s, Chögyal Namkhai Norbu made a pilgrimage to Tibet, India, and Nepal. While he his visit in Sikkim in 1959, As the Chinese forces occupied Tibet in 1959, he was unable to return to Tibet and hence, remained in Sikkim working as an author and editor for the Government of Sikkim.